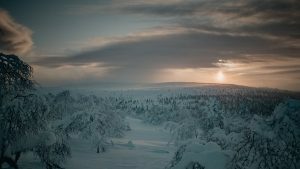 It is in the icy wilderness of Finland’s Ivalo, with its endless stretches of white snow and intensely bright sun, that a group of the country’s biggest production companies have joined forces to deliver a major new drama series. Kaltrina Bylykbashi reports from the set in Lapland. Sitting in the Ravintola Huippu restaurant at the top of Kaunispää fell, the international flavour of what is set to be new drama Arctic Circle is immediately evident. Sat among the tables of production hustle and bustle are teams of Finnish, German and French nationalities all discussing their work in various languages. This mix of local and global is core to the show’s premise: primarily English language and set in a small town, Ivalo, with lead characters coming from Finland, Germany and, sometimes, other mysterious locations. 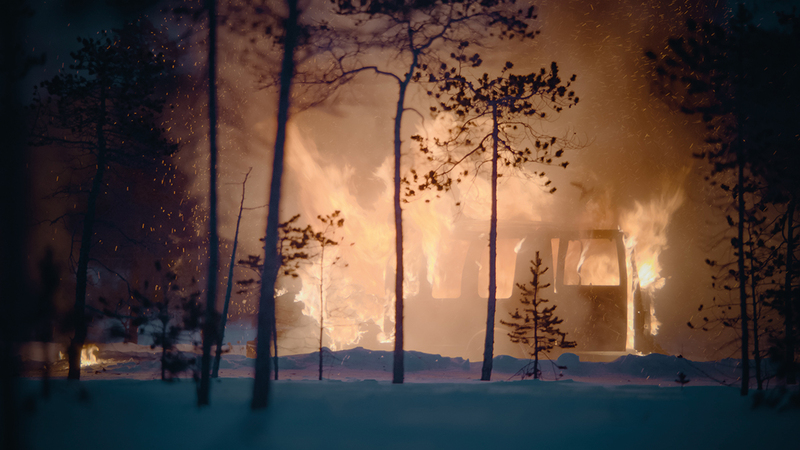 The part-crime drama, part-medical thriller follows the life of small-town cop Nina Kautsalo (Iina Kuustonen) after she discovers an abused prostitute in the wintry back country of Finnish Lapland. However, if you think that sounds like your typical Nordic noir drama, German virologist Thomas Lorenz (Maximillian Bruckner) joins Kautsalo and discovers that the young victim carries an extremely rare and lethal virus. The duo ultimately team together to fight what looks like it will be a global threat, and it is these elements that the coproducers, Finland’s Yellow Film & TV and Germany’s Bavaria Fiction, believe sets the series apart from its progenitors. Within the coproduction, a range of European media outfits have gathered together to create the biggest Finnish budget yet on a TV series, with the show set to debut towards the end of 2018. Joining Yellow and Bavaria are Finland’s national broadcaster YLE and its local OTT service Elisa Viidhe, who have additionally funded the show along with government tax breaks reserved specifically for the picturesque area. French distributor Lagardère – an outfit that has been seeking out quality productions from all over Europe – has also joined the fold. “We in Finland like to compare ourselves with other Scandinavian countries,” says Jarrko Hentula, a producer for Yellow. 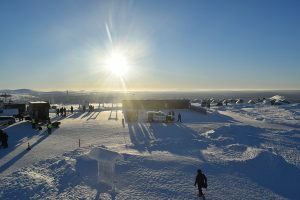 Ivalo’s climate, with its ice-cold temperatures that can reach -35C, and its extreme periods of light and darkness are core to Arctic Circle’s tale. As the first drama set in the location, the production partners believe that it will be a unique point of distinction. In the same way, the genre blend, which combines crime and medicine, alongside an emotional, character-driven plot, separates it from a typical Nordic noir or Scandi drama. “That mix of crime series and medical series, tracking the criminals on the one side and the virus on the other side, that is something new and quite unique,” says Lagardère’s director of acquisitions, Frédérik Rangé, about discovering the series. “The combination is something I felt very interested in. The series producers have also brought in Finnish-born Hannu Salonen, who is a well-known director in Germany, alongside its main stars: well-loved Finnish soap actress Kuustonen and distinguished German actor Bruckner. Casino Royale’s Clemens Schick and Joi Johannsson (Shetland) have been cast as international bad guys. Arctic Circle will next travel south and be presented to buyers in warmer climes of Cannes at MIPTV. “The funny thing is, in the beginning I thought Iina [Kuustonen] was the main actress and I was the main actor. Now I realise the landscape is the third main character in this series, and it’s unbelievable. “We were shooting yesterday and the wind was blowing like hell. You wanted to speak but your mouth was full of wind. It’s a real challenge. The show is described as The X Files meets Lost, but set in Antarctica. 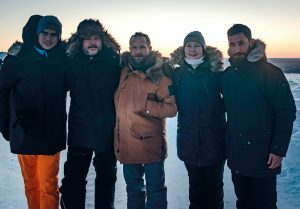 Developed by Enderby’s Rick Dugdale and written by Orphan Black’s Will Pascoe, the series will peek into conspiracy theories around global warming in the region. Hot-shot lawyer Rebecka Martinsson has a new job at a top Stockholm firm, but she receives a phone call from the small town, way up in the Arctic Circle, where she was born where a close, old friend has died in an accident. As the veteran among the list, Fortitude reaches its final chapter as it follows the aftermath of the murder of corrupt mayor Erling Munk at the hands of a mob led by Sheriff Dan Anderson in the small isolated, fictional town of Svalbard.